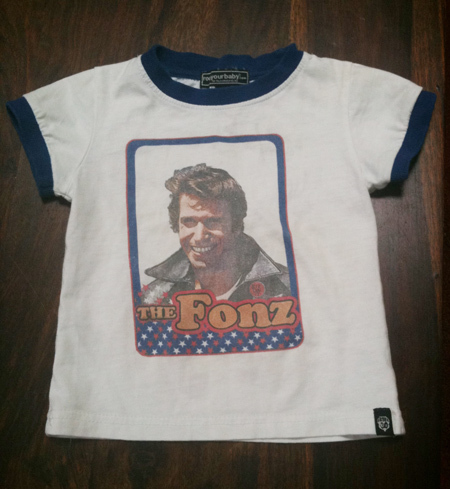 This is the t-shirt my 15-month-old son was wearing yesterday. 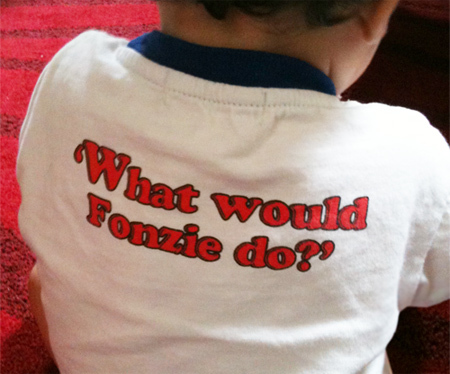 “What would Fonzie do?” it asks. Good question, t-shirt. - Having a runny nose and continuously sneezing, usually right at his mummy’s face. - Producing 6 pooey nappies. All before midday. Yes, clearly my son has caught some kind of yucky virus. Either that or there’s some messed-up episodes of Happy Days out there. That explains why Fonzie’s office was in the toilet. Indeed. Although that would negate the need for nappies, you would hope.